Isaac Newton 15N is among the first 21 BSN students to complete the VANAP program. He has begun a yearlong residency at the Atlanta VAMC, which will further enhance his skills as he embarks on a career in veteran nursing care. Emory's Barbara Kaplan (center) teaches simulation training at the Atlanta VAMC. Lisa Muirhead is the Emory coordinator of the VANAP program for BSN students. Now in its third year, the program is increasing BSN enrollment by 100 students over five years. 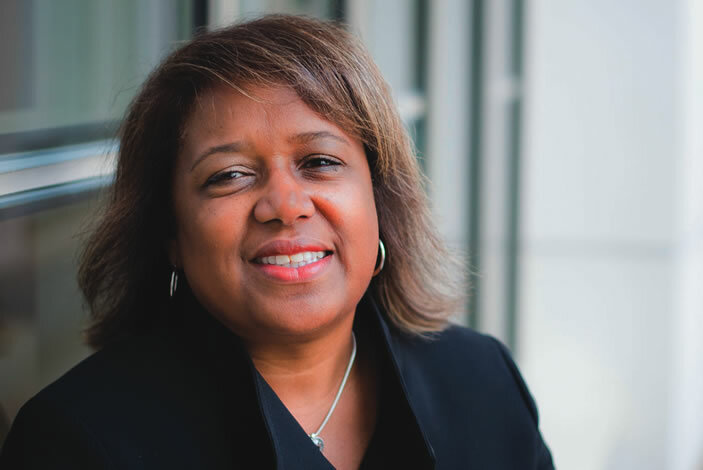 Phyllis Wright is the Emory leader of a new VANAP program to meet demand for nurse practitioners specially trained in primary care for older veterans. 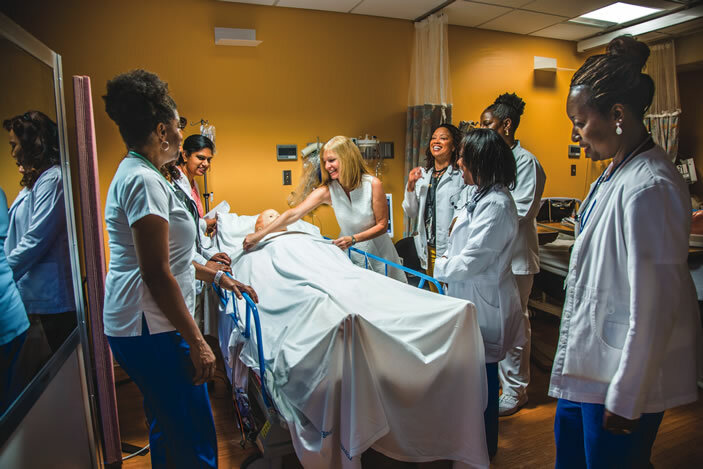 The Nell Hogdson Woodruff School of Nursing and the Atlanta VAMC partner on several initiatives in addition to the VANAP programs for BSN and MSN students. The National VA Quality Scholars Advanced Fellowhips train nurses and physicians to develop innovative approaches to enhancing health care services for veterans. Dedicated education units, or DEUs, provide one-on-one clinical training for BSN students in psychiatry/mental health and geriatrics at the VAMC. This past summer, six juniors completed clinical internships at the the VAMC sponsored by the VALOR (VA Learning Opportunities Residency) Program. All of the students are in the VANAP program for BSN students. In the 2009 movie The Hurt Locker, Staff Sergeant William James leads a bomb disposal unit in Baghdad, where he faces the prospect of sudden injury and death in ways that are harrowing and cruel. It becomes a normal way of life for James, who can't adjust to the rhythms of family life when he returns home. Domestic life proves so mundane that he signs on for another tour of duty in Iraq. While James's situation is meant to be dramatic, it's a stark reminder of the difficulties that men and women face after serving in a war zone. It's estimated that 20 percent of veterans returning from Afghanistan and Iraq experience post-traumatic stress disorder (PTSD), one of many problems they often face. "We owe veterans a lot," says Lisa Muirhead DNP RN APRN-BC ANP, clinical assistant professor in the School of Nursing. "They leave their families behind when they are deployed. They subject themselves to explosive devices and wearing heavy gear in the field. They come back home as changed individuals, and the adjustment can be huge. It's a different battlefield." That notion is being infused more deeply into the nursing curriculum via two programs led by Emory nursing faculty and Atlanta VA Medical Center (VAMC) nurses. 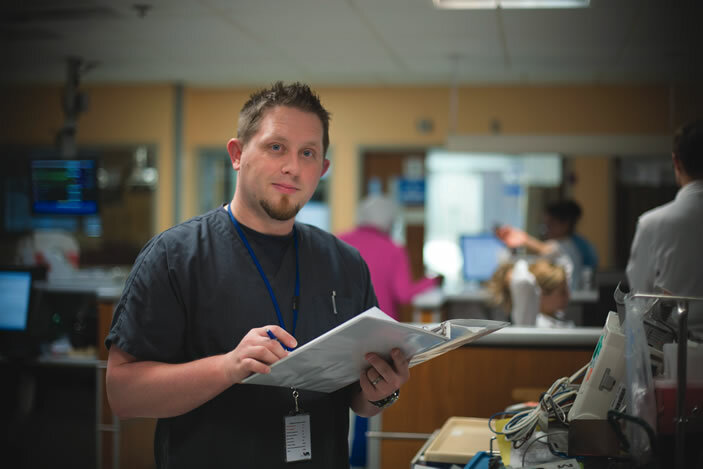 The programs provide specialty education in veteran care for BSN and MSN students, respectively, and create new faculty positions held by VAMC nurses who train academically at the School of Nursing. They are funded with separate awards totaling nearly $10 million from the U.S. Department of Veterans Affairs (VA). Both programs aim to strengthen health services for veterans and the pipeline of qualified nurses who care for them. May 2015 marked a milestone in the life of each program. First, the VA selected Emory and five other U.S. nursing schools for the VA Nursing Academic Partnership for Graduate Education (VANAP-GE) to train advanced practice nurses to care for aging veterans. Through VANAP-GE, Emory will add five faculty positions, to be held by VAMCnurses, and grow its adult/gerontology nurse practitioner program by 32 students over five years. The first six students began the program this fall. Also last May, the first students in the VANAP program for undergraduates received their BSN degrees after two years of courses at Emory and clinical rotations at theVAMC. All trained in various aspects of veteran care, including mental health, traumatic brain injury (TBI), home-based health, women's health, and homeless care. Now in its third year, VANAPis funding 10 new faculty positions and adding 100 BSNstudents over five years. 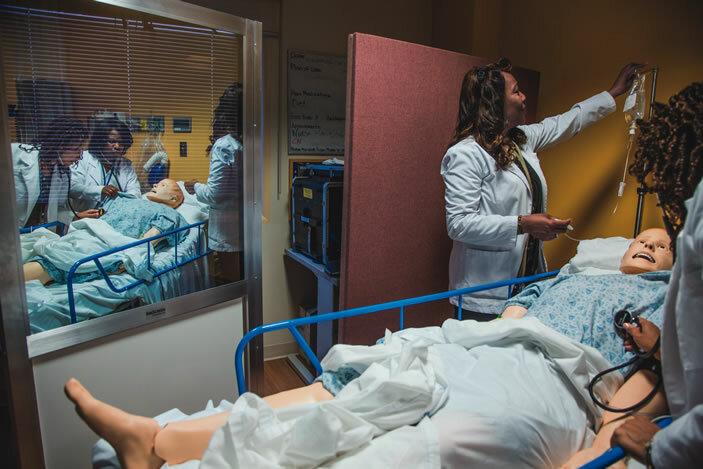 It also includes a clinical innovation component to provide refresher courses and simulation training for VAMC nurses, all taught by Emory faculty. The need for qualified nurses is top of mind for VA leaders. "We are one of the largest and fastest growing medical centers in the nation," said Atlanta VAMC director Leslie Wiggins during a recognition ceremony for VANAP students a few days before graduation. "We've gone from serving 96,000 to 100,000 veterans in the past 12 months." "This first cohort of students is very special, and it's going to put us on the map in a way we've wanted to be for a long time," Wiggins continued. "You leave a legacy for those who come behind us to continue our work." Training for VANAP scholars doesn't necessarily end when they graduate. Of the 21 BSN graduates, 16 plan to work at the Atlanta VAMC after completing one year of residency (working on different units) or one year of transition to practice (working on a specific unit). Students are not obligated to work for the VAMC. One new graduate was accepted into a PhD program, while others plan to work at other hospitals. That's okay with Muirhead, the VANAP coordinator at Emory. "Seventy-five percent of veterans receive health care outside of the VA," she says. "Whether graduates work within the VA or branch out into the community, they will understand the needs of veterans and their families." 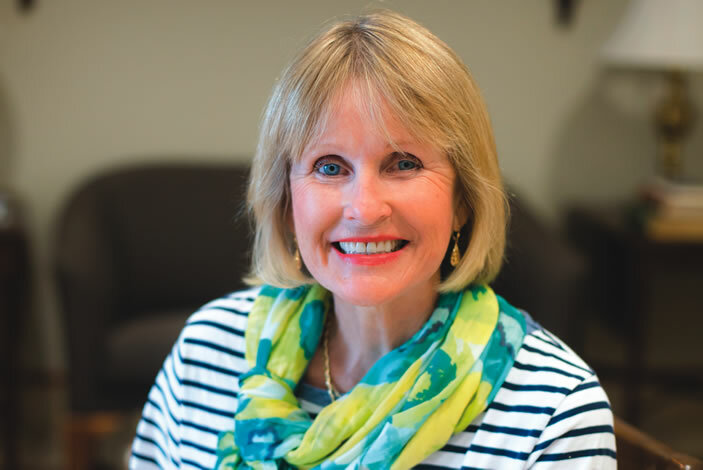 Phyllis Wright DNP APRN-BC, Muirhead's counterpart in the VANAP-GE program, oversees the training of nurse practitioners to address the shortage of primary care nurses in the VA health system. The shortage is expected to intensify as more and more nurses retire and the number of aging veterans who need primary care grows. Over the course of four semesters, VANAP-GE students will receive a stipend for clinical practice hours, which include advanced training in primary care, women's wellness, mental health, geriatrics, home-based primary care, palliative care, and HIV/AIDS care. When they graduate, students will be eligible to sit for the national certification exam in adult health/gerontology primary care nursing. The grant also calls for developing a paid residency program open to all NPs in adult/gerontology primary care. The first cohort will begin in March 2016. "We have great buy-in from [VAMC chief nursing officer] Sandy Leake," says Wright. "She sees the advantage of training six more nurse practitioners and six more residents a year. When they get up to full speed, each NP can see an average of 15 patients per day. That adds up to a lot of patients per month and per year." VANAP-GE also provides startup funds for an Emory faculty practice at the VAMC. One option on the table is expanding the intake clinic for newly returned veterans. "That process is so backlogged that it often takes many days to be seen the first time," says Wright. "An Emory faculty practice could stay open after hours or on Saturdays to increase access for veterans. Our goal is to develop a sustainable practice long after this grant expires."